Godzilla: King of the Monsters Trailer Is Finally Here! Monster fans have been waiting since 2014 to see Godzilla: King of the Monsters, and while we still have quite a bit to wait, director Michael Dougherty has unleashed the first trailer at San Diego Comic-Con, ahead of the May 31st, 2019 release date. Last week, we were given a sneak peek at some high-resolution images that put the focus on Godzilla's glowing blue atomic breath as well as our first look at Stranger Things actress Millie Bobby Brown as Madison Russell and Vera Farmiga as her mother, Dr. Emma Russell. Godzilla rises from the depths in the first trailer for Godzilla 2, showcasing a bit of a belly this time around. It's possible that the iconic monster has been a little lazy since his last outing in 2014. However, now is not the time to be lazy as the humans start to grow more and more paranoid by the second, expecting more monsters to appear on Earth to wreak havoc. As it turns out, that paranoia is well-warranted this time around. 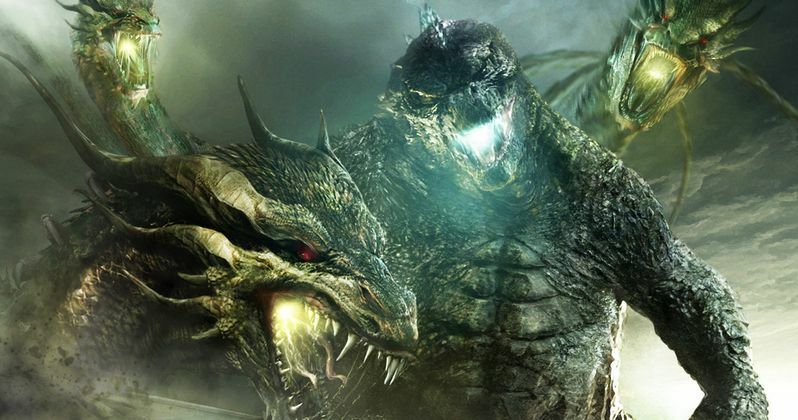 Godzilla 2 has the official title of Godzilla: King of the Monsters, but according to director Michael Dougherty, the legendary monster is going to have some major competition this time around. King Ghidorah, Mothra, and Rodan will all be featured in the hotly anticipated sequel. Dougherty says that Rodan is going to be much more than a sidekick this time and teases that the monster may even be more powerful than Godzilla, comparing him to a "winged A-bomb," which sounds pretty intense. Dougherty went on to say that Rodan is one of his favorite characters and believes that Godzilla 2 has done the character justice. Months before Michael Dougherty had been asked to direct Godzilla 2, he had already been brought aboard to co-write the film with Zach Shields. Dougherty has promised that there will be horror elements in the sequel, which makes sense, considering the director's background. Dougherty directed Trick 'r Treat and Krampus, so audiences can expect more of a monster thriller this time around with a few more monsters to up the ante and shock value. Shields previously worked on Krampus with Dougherty, which makes the first footage seem like a different, more horror-focused direction for the Godzilla franchise. Warner Bros. recently delayed Godzilla 2 for a few months, taking the release date from March 22nd, 2019 to May 31st, 2019. There was no explanation given, but a release right before summer seems like a smart bet for the monster movie, especially considering that Marvel Studios is releasing Captain Marvel in March and then Avengers 4 at the beginning of May. Godzilla 2 should pretty much have its opening weekend to itself when it hits theaters next year, but the star will have to share some screen time with some new monsters. For now, you can check out the awesome first footage from Godzilla 2 below, thanks to Warner Bros.